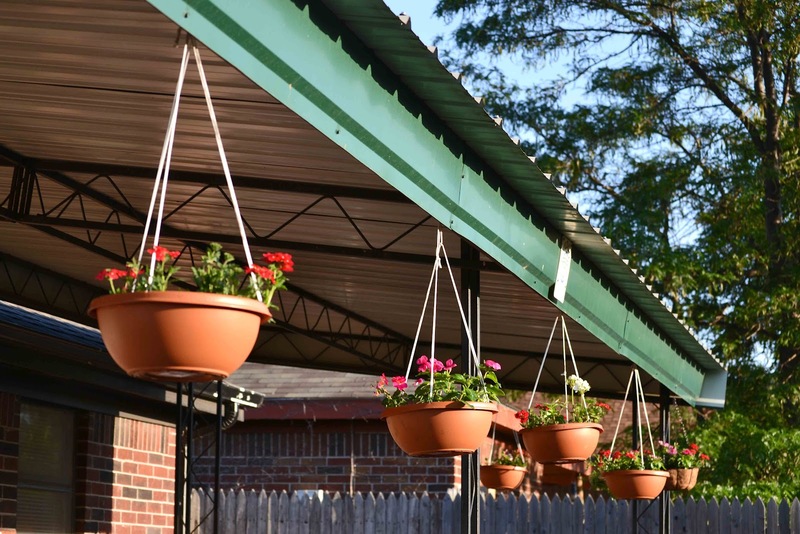 I wanted some hanging flower pots on my back porch. It just can get so expensive buying the pre-made flower pot. So I decided to make our own with my children. It turned out to be a lot of fun and a whole lot cheaper. I picked up the pots at Dollar Tree. They were only $1 per pot. We also went to Lowe's and I had my children pick out the flowers they wanted to plant. They loved picking out their own! We also bought some soil to plant in. It cost me about $4-5 per flower pot. We made a HUGE mess planting, but my children LOVED it! 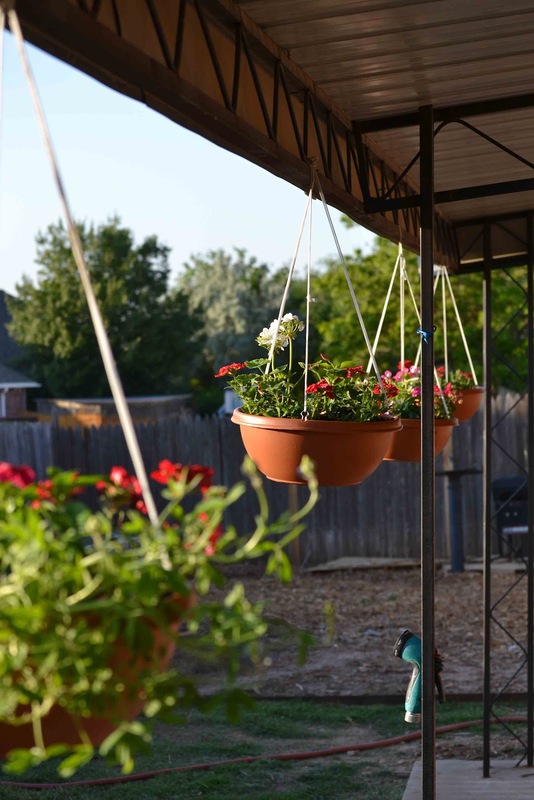 Having flowers hanging make such a huge difference in our backyard! It makes me want to go out there all day! Your patio is completely adorable!! Thanks for finding me at Pink on the Cheek! xoxo have a great rest of the week! Love it! I found the trick to making flower pots flourish is to water them Every Day. Good luck! The dollar store should always be my go to for things like this. We'll definitely be doing this next week. Thanks for the inspiration! 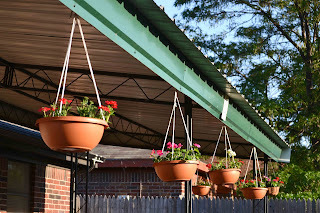 I have been wanting some hanging pots, too, but the price has kept me from buying because I have a wrap-around porch! 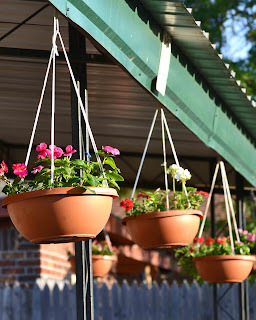 I never even thought about the dollar store having pots (duh moment!)! Thanks for posting! Great idea to make your own hanging pots! We put some up at our last house and they made such a difference! 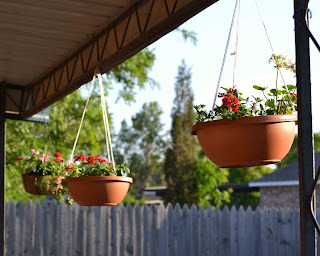 i always want to have hanging pots, but i'm not sure how i'd water them. i'd love to get some ferns, tho. The look lovely. I would love to have you come and link up to the Creative Corner Hop. THe linky party begins every Monday and stays open all week long. I love that you made this a family project! I really would like to put some hanging plants on my porch. I'm so glad to know I can get the pots at Dollar Tree...I love a good bargain! Thanks for inspiring. LOVE IT!!! messy + happy kids = my kind of afternoon!! thanks for the kick in the pants to get my backyard going haha...i'm a new follower/stalker via pine creek's link up!!! I love your budget version - dollar store pots is a brilliant idea! The kids did a great job picking out nice plants....and the pots turned out great. These turned out so beautiful. I can't believe those pots were only a dollar :) Thanks for sharing at Sharing Saturday. Love the flower pots and the new header!! Thanks for sharing at Things I've Done Thursday! This is such a good idea! 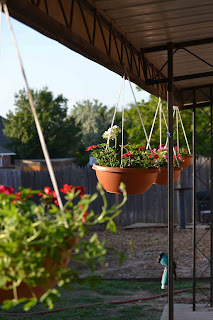 I never buy the hanging pots, they are just to darn expensive. I'll have to try this though. Thanks for sharing at Terrific Tuesdays. awesome ideas. love hanging plants. These will just get better and better all summer long!